After appropriate inner packages and master cartons have been selected and goods enclosed within them, the next order of business is bringing your products to market, landing them safely at wholesale warehouses and retail outlets. As orders are assembled, every effort is made to ensure damage-free delivery, including a commonly used measure of protection for securing items during transit. Plastic sheeting or strips wrapped snugly around cartons and stacked freight prevents them from shifting, protecting boxes, tubes, and parcels from damage during shipment. Stretch film addresses specific shipping tasks, so the best varieties to use are chosen based on the size and configuration of your routine orders. Manual stretch film options serve businesses of all sizes, each type supported by a full range of film dispensers and accessories. Facilities utilizing greater automation benefit from machine stretch film approaches providing consistent high-volume stretch film capabilities. Whatever your shipping and warehousing needs are, packaging suppliers have stretch film solutions available to reduce damage loss and keep your shipping operations flowing smoothly. Films are stretch by-hand, or with the help of automated wrapping machines. The best method for each shipper to use depends on volume, order-size and a host of other individual factors. Cast Machine varieties are capable of stretching film up to 250%, providing tightly contained pieces for shipment. And irregularly shaped bundles benefit from Blown Machine Stretch Film, which is puncture resistant and performs well under a variety of extreme conditions. Crystal-clear films help identify packing lists and allow for easy product identification, but opaque blown film varieties are also available to conceal shipment contents. Hand stretch film is also drawn from rolls, but stretched manually using hand-held dispensers rather than being pulled taut by machines. Hand films are effective for containing uniform loads, providing several distinct options for items of varying weights. 60-Gauge film, for example, is appropriate for loads weighing up to 1600 pounds, while 120-Gauge material firmly secures up to two tons of goods. Films used for special applications include varieties with built-in anti-static agents, as well as options of assorted colors. Colored film provides easy inventory control, and allows shippers to identify themselves with unique outer-wrap colors. For irregularly shaped shipments or jutting parcels, packaging suppliers provide clear blown film, or a black variety, which completely hides items from view once wrapped. Corrosion inhibitors are present in VCI Stretch Film, making it the perfect choice for wrapping large metal parts. Further accommodating hand stretch film users, products like Goodwrapper and Extended Core films are outfitted with built-in dispensers, keeping them at the ready without additional equipment requirements. Not every shipping effort is pallet-sized, so convenient hand bundling films provide stretched-in protection for smaller parcels. One-handed operation draws film from roll-dispensers, either built-in or reusable. 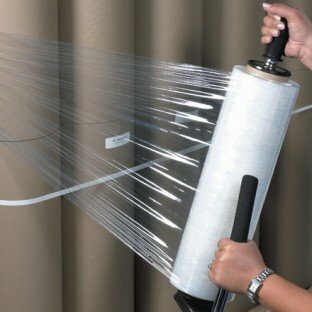 Stretched bundling film acts like tape does; holding items securely in-place during transit, but is a more affordable solution than strapping and tape. Colored film varieties help identify tubes, boxes, and other bundled items, allowing efficient warehouse inventory management. Whether shipping fully-loaded pallets or simply bundling related parcels, stretch film alternatives provide consistent low-cost protection during transit.